Hey everyone! Today is officially the last day of summer, so I thought I’d do one more Hurrah to summer! Not to say I won’t wear bright colors in the winter. My motto is All the Colors All the Time! Today I have Dance Legend 578 from the Comme Il Faut line. 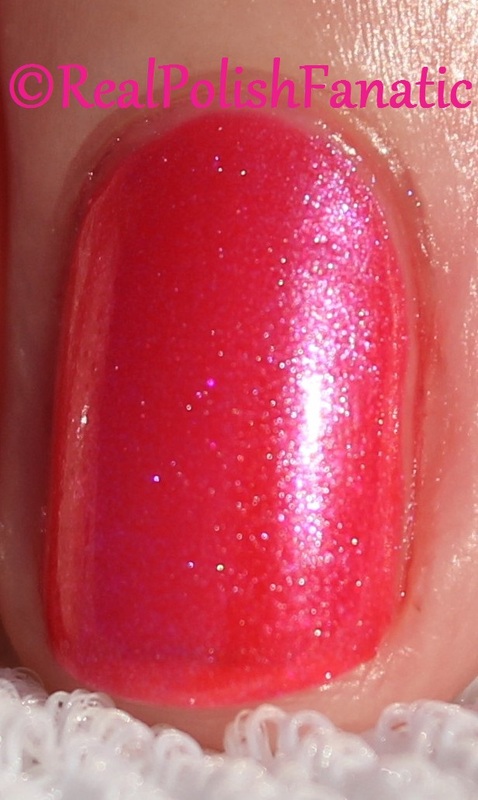 This is a pretty, bright, medium pink with blue shimmer. It really glows! Formula was very good. I used 3 coats plus topcoat. You can still see through to the nail line a little bit. Even without topcoat this one dries very shiny! As an accent I picked Esmaltes da Kelly Pina Colada. A pretty white crelly base with multiple sizes of glitter in pink, green & blue. There are at least 4 sizes in there. I added a little nail polish thinner and that helped my application. I did have to fish around a little to get the large pink glitter out. Again, I used 3 coats plus topcoat. I love these two polishes together. Dance Legend 578, 3 coats plus topcoat & Esmaltes da Kelly, 3 coats plus topcoat. Well, that’s my final mani for summer 2015. The polish in this post is from my own collection & was purchased by me.